If a run is particularly long with data which is not required at the start or end of the run, it can be shortened to reduce data processing time and file sizes. This is typically the case if you started logging data whilst you were still in the pits before the race. Removing this redundant data saves hard disk space, makes re-processing faster and reduces the memory required of the software. 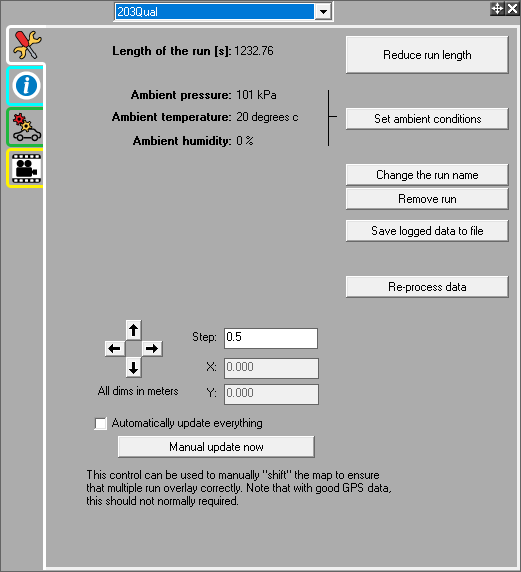 To do this, select "Reduce run length" from the run manager. Type the time intervals for the section of the run which should be kept into the next box and click on "Trim now". After trimming, data will require reprocessing before it can be viewed. 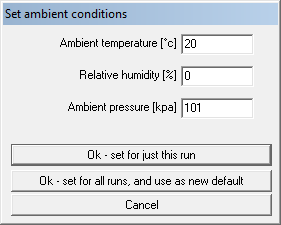 Accurately setting the ambient conditions for a run will give the most accurate power readings. The power output of an engine varies with temperature, pressure and humidity. If this data is known, it is possible to apply corrections to the power figures to give consistent reading irrespective of the current conditions. An individual run can be deleted by selecting the run you wish to remove in the Run Manager, and clicking on the "Remove run" button. This option deletes the run entirely from the software memory, but it does not effect any run data file on your hard disk or flash card. You can save the raw, unprocessed data at any point to a .run file, by clickiong on "Save logged data to file" on the Run Manager. This will only save the data that is loaded into the memory, i.e. if you have trimmed a run, the trimmed parts will be omitted. Also, if you save a file when you only have certain variables turned on in the Variable Manager, the data for all variables will be saved. There are 2 ways to reprocess the data: To process an individual run this can be done by clicking on the "Re-process data" button within the run manager. If you wish to re-process all the data then this can be done most easily by going to > Data > Re-process All Data. For more information on re-processing, click here. The Manual Map Offset feature allows you to adjust for the GPS inaccuracies that lead to track maps not sitting squarely upon one another. Use the "Step" box to set the increments by which you wish to adjust the track map. A small number in this box will allow you to adjust the track map by very small and precise increments. A higher number will allow you to adjust the map using bigger steps. 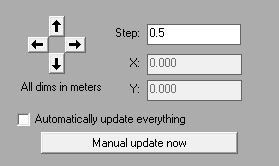 When the box marked "Automatically update everything" is ticked, updates will be displayed as you make them. This may take some time. By un-ticking the box, the alterations that you have made will only be displayed when the "Manually Update Now" button has been pressed. To adjust the disparities in the track maps, simply use the arrows to "slide" one run onto the top of the other.